It's starting to become general consensus around Tim Burton fans that the director is at his best when he sticks to making movies based completely on an original idea, rather than adapting someone else's work in his own unique style. So what happens when the man decides to adapt one of his own former creations for the big screen? 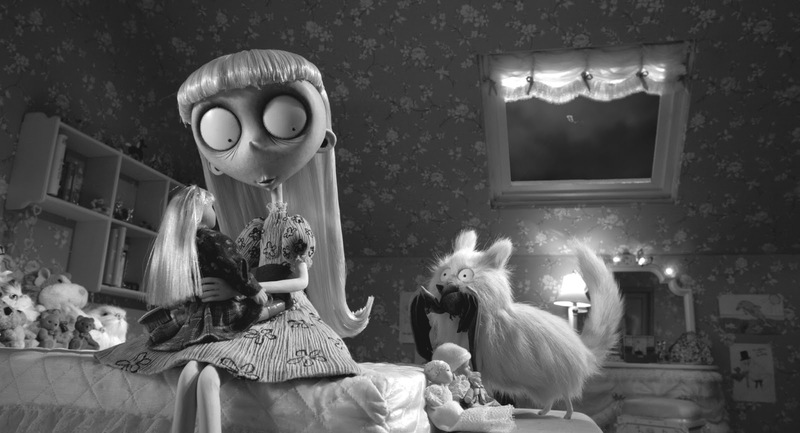 Well, let's take a look at Frankenweenie. 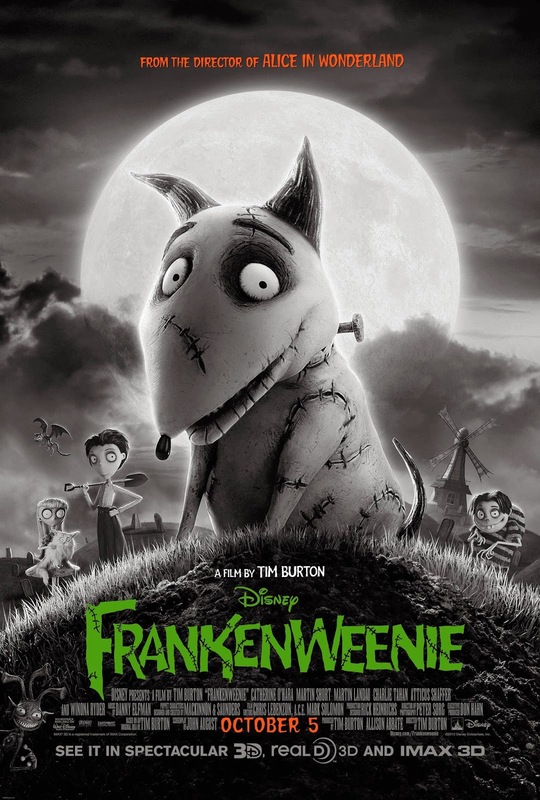 Taking a middle school spin on the classic tale of the man who created a monster, Frankenweenie is a lot more heartwarming story about a boy and his dog - and how the boy decided to play god in order to have the dog stick around post mortem. 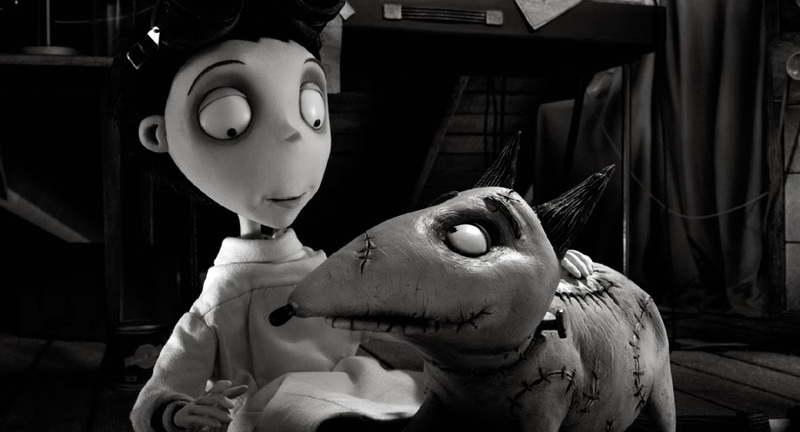 The original Frankenweenie was only about 25 minutes long and the story has certainly gone through some changes in order to better fit the big screen. More plots have been added, more characters and the film is now littered with references for the horror fans to pick up on. The movie is of course, as many other Tim Burton originals, done entirely in stop-motion animation. It's a great way to pick up on the creepiness that the Burton artstyle entails, if you've seen any of Burtons other animated features (Corpse Bride, Vincent, The Nightmare Before Christmas) you can easily recognize the style. The big and heavily shaded eyes being as present as ever. This kind of story is also where this artstyle "belongs", so to speak. While I love the style personally, it is kinda off-putting to see the style used for classic childrens stories as has been done with Charlie & The Chocolate Factory and Alice in Wonderland. Another thing they decided to do was make the entire movie in black & white, possibly to enhance the feeling of the story taking place in a 1930's Universal Pictures horror-movie, this also means that the movie has absolutely beautiful work with shadows - akin to that of the german impressionism and the movies of which it parodies. 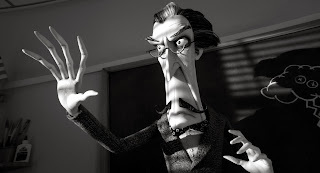 This isn't the first time Burton has delibaretly chosen to shoot in black & white, both the original Frankenweenie and his bio-pic of the desperate 50's director Ed Wood were done in this style. This isn't something tacked on, Burton has a geniune love for the era. This is where I unfortunately have to put the praise to a halt, because while I definitely enjoyed myself during the movie it wasn't shot with my age group in mind. No, this film was supposed to be a childrens movie and I very much doubt that a superior number of kids would get much enjoyment out of this film. Much of the humor in the film comes from references to monster movies, little gags such as the japanese kid pulling out a camera at the sight of a giant monster or a female poodle getting a white line in its hair much akin to the look of the Bride of Frankenstein. While I certainly got a laugh out of some of them, I picture a lot of kids wouldn't. Then again, I'm just some guy what the heck do I know what the kids are into these days? However, many countries must've felt the same because while the movie certainly got a theatrical release, it wasn't dubbed into all that many languages. In Denmark, for one, the movie was only released with subtitles. One the other hand, the extended story is actually pretty cute. I commend the ability of the animators to really capture what an animal would act like. Frankenweenie isn't some super intelligent dog who knows exactly what to do in all situations. He's still just a dog so he will act irrationally and misbehave sometimes, just like a real dog would. I don't know for certain if I should commend the movie on the animals being the most convincing characters however. As for the acting of the humans, they do a well enough job with what they've been given. The characters aren't particularly deep, but taking into account what the actors were given to work with, well there's not much else they could do than just sticking to their guns and try to deliver a great performance - which they do. 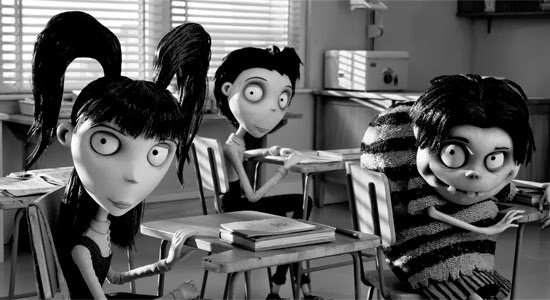 The characters of the movie, while all fun to look at (sporting the burton artstyle helps) none of them are "normal". With the possible exception of Victors parents, all the main characters of the movie have some kind of absurd character trait. One kid looks, as an example, exactly like the stereotypical hunchback lab assistant that would show up in a Frankenstein movie. It is off-putting at first but fortunately the movie and the story is actually well-written enough to make the characters work and in spite of their absurdity I still found the characters likeable - I wanted them to succeed in their endeavours. You cannot ask for much more when the focus of the movie is elsewhere. Frankenweenie is a cute version of the classic Frankenstein tale, and had the movie not relied too much on referencing the entirety of the horror genre from a certain era the film could've been a truly great introduction for kids to the story. Key moments from Frankenstein are certainly present in the film to some extent, but the extra layer of movie references is just way too much to take in at once at some points. There is fun for horror fans, Burton fans and animation fans alike in this film - as for the rest of you perhaps you will find something in the tale of a boy and his dog, and how hard it can be to let go when the time finally comes.